Vitalis Joseph a vegetable farmer from Bermi in Babati District, Tanzania watering his Ethiopian mustard vegetables. 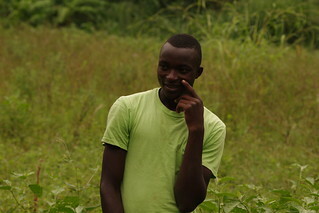 He is among the smallholder farmers who have adopted elite vegetable varieties promoted by the Africa RISING project (photo credit: Inviolate Dominick/WorldVeg). Persistent global hunger and undernutrition have underscored the need for urgent action towards achieving the Sustainable Development Goals (SDGs) that aim to end all forms of malnutrition and double the agricultural productivity and incomes of small-scale food producers by 2030. In sub-Saharan Africa, lack of dietary diversity is a key causal factor of malnutrition since a big part of the population consume mainly staples as their main food, which are high in carbohydrates, but low in micronutrients and vitamins. To address this dietary diversity and incomes gap, encouraging farmers to grow elite varieties of traditional African and global vegetables can make an important contribution to nutritional security and extend the income generation opportunities for smallholders as is already being illustrated by interventions by the Africa RISING project among farmers in Tanzania. Since 2013, the project has targeted over 6,000 smallholder farmers in seven districts across Tanzania to promote vegetable farming as a complementary agricultural activity in the largely maize-dominated farming systems. Through capacity building for farmers about vegetable farming (from raising seedlings to marketing) and provision of seeds through a cascading scaling model; results are beginning to show that many farmers are turning to farming of the leafy greens. Vegetable farming has become a viable agri-business alternative with great potential for income generation. Vitalis Joseph, a 32 year-old from Bermi Village in Babati District in the northeast Tanzania is one such farmer. His first interaction with the Africa RISING project staff was in 2013 when he had attended a meeting in his village that was convened by representatives from the World Vegetable Center. At the meeting, the team explained to the farmers how they could improve their nutrition and also earn additional income for their families through vegetable production. Joseph had been growing vegetables marginally before but had never considered it something that could earn him significant income. 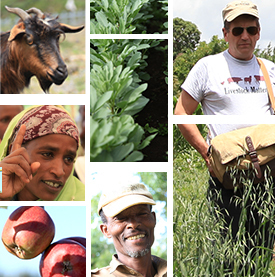 Soon after, he started growing and selling tomatoes, Ethiopian mustard and amaranth. He notes that there is always a high market demand for the elite varieties he was introduced to by the project. Out of the proceeds from vegetable farming, he has constructed a permanent house for his family. ‘My friends and neighbours will tell you that I am where I am now because of farming and selling these vegetables. I come from a very poor background and others even wonder how I have managed to achieve this,’ says Joseph with a tinge of emotion. Yet Joseph’s story is not an isolated one of the still unfolding success of Africa RISING’s vegetable technology interventions towards fighting poverty and malnutrition in the region. Similar stories of success from vegetable farming have been documented from both young and old farmers. ‘From my ¾ hectares of land where I grow tomatoes and other vegetables while also keeping chicken, I now earn nearly TShs 6 million in a season (approx. USD 2,500). In the old system, where I grew maize intercropped with pigeon pea I would earn just about TShs 2 million,’ says Monica Paschal (read her story). ‘This is now the third time that I have produced my own vegetable seeds from the WorldVeg varieties. Out of the six varieties they introduced to my village, I have chosen tomato (Tengeru 2010), African eggplant (DB3), and African nightshade (Nduruma). These are the best I have ever grown. I don’t need any other crops. I was able to harvest 20 bags of African nightshade, where I previously produced only 1.5 bags. My tomato yields have doubled, and I am still harvesting African eggplant from the seed that I sowed half a year ago! With these new varieties that are in high demand in the market, my income has increased by more than TShs 400,000 per season (USD 190),’ explains Haasan Saidi, who lives in Maweni Village, about 25 km east of Babati town (read his story). The combined use of healthy seedlings with good agronomic practices has increased tomato production in the majority of the Africa RISING vegetable activity intervention sites by 3.4 times and of African eggplant and Amaranth by 2.8 times each. This turned out to be more of an economic venture and generated extra interest in identifying methodologies for better storing the increased quantities produced and accessing viable markets. 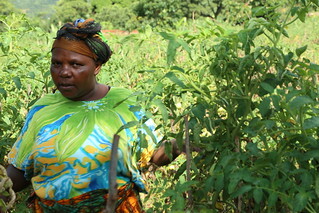 Considering that typical smallholder farming households do not only focus on one activity like vegetable farming, livestock nutritionists involved in the project have started using the non-edible components of the vegetable plants as feed components in the poultry rations as highlighted in Monica Paschal’s story. ‘Data from the project sites in Babati, Kongwa and Kiteto districts show that from 2014 to 2016, farmers increased tomato production, on average, from 10.7 to 17.2 tonnes per hectare, African eggplant production from 8 to 14.4 tonnes per hectare, and amaranth production from 8.6 to 12.2 tonness per hectare following community sensitization, use of quality elite vegetable variety seeds and training in healthy seedling production,’ explained Justus Ochieng, a WorldVeg scientist. 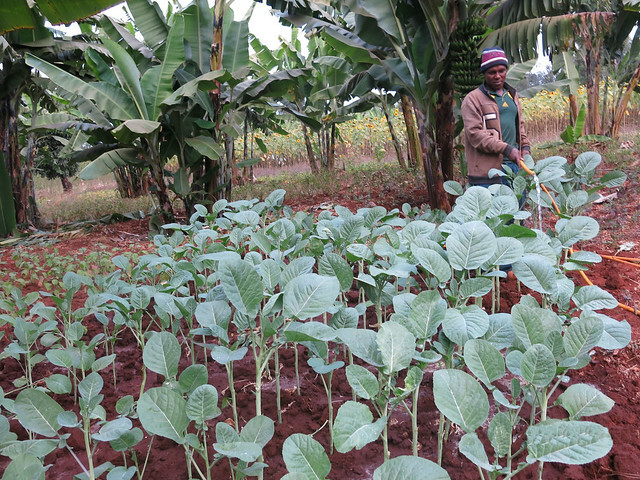 Besides, a survey conducted in villages hosting demonstration sites in Babati District shows that 32% of the farmers have adopted elite seeds and healthy seedlings while 59% have started using inorganic fertilizers in producing vegetables. Many farmers (67%) are following other good agronomic practices, mainly mulching, timely weeding and planting, and manure use in their farms in order to ensure healthy growth of vegetables. Ochieng adds that linking of farmers to high value markets has enabled several of them to sell their produce at higher prices. Other income was generated from selling healthy seedlings to neighbouring farmers through nurseries that they had set-up as a result of the increasing demand. These approaches have been particularly successful in the Africa RISING research villages of Matufa, Bermi, Galapo, Seloto and Shaurimoyo in Babati District where farmers utilize collective marketing of vegetables to access markets and reduce transaction costs. Most farmers in the project have realized higher incomes from all the crops (amaranth, nightshade, African eggplant and tomato) planted which reflects the higher yields that they were able to achieve. Many of them also claim to have increased their household consumption of vegetables since the project started. Increases in income are clearly important for reducing malnutrition. Greater incomes at the household level allow families to spend more on food, clean water, hygiene and preventive and curative healthcare. It gives families access to a more diversified diet and better childcare arrangements. At the community level, greater income will eventually lead to better access to and higher quality healthcare and diversified diets, improved water and sanitation systems, and better access to information. Note: The data used in this story was generated from the Africa RISING ESA and the Africa RISING-NAFAKA projects. Implementation of both vegetable research and scaling activities is led by the World Vegetable Center. Writers and contributors: Jonathan Odhong, Justus Ochieng, Andreas Gramzow, Inviolate Mosha and Gloriana Ndibalema. Tags: AfricaRISING, sustainable intensification, Vegetables, World Vegetable Centre. Bookmark the permalink.